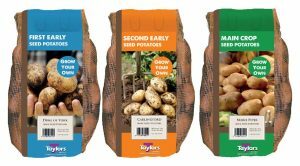 Harvesting Time – You might notice that our different seed potato packs are colour coded; blue for “First Earlies”, orange for “Second Earlies” and green for “Maincrop”. 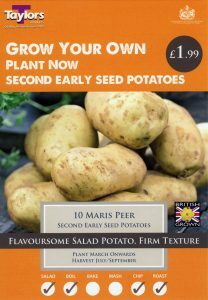 First and Second Earlies will give you “new potatoes” in the summer, Maincrops will give you tubers for eating in the autumn and enough to store over winter for later use. 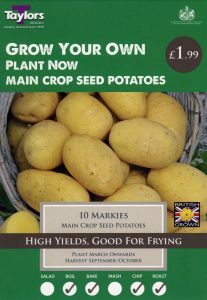 First Earlies will typically be ready for harvesting in June/July, Second Earlies in July/August and Main Crops from August onward but if storing then can be harvested in September or October. 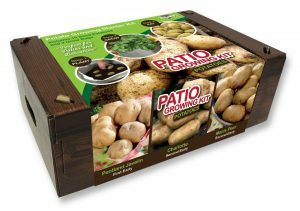 Container Growing – Early varieties are best suited to container growing; a particular favourite is Carlingford – a second early variety and a good all-rounder (good for salads, boiling, baking mashing etc). 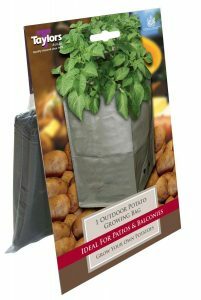 Why not try our Potato Growing Bags or even our Potato Growing Kit. Charlotte – Second Early, great for salads with great flavour. 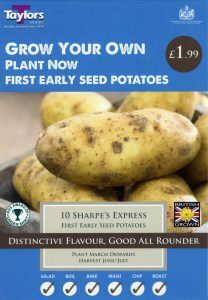 One of our most popular varieties. When I was a child we used to have baked potatoes with really thick skins. What variety would this have been, I ‘d love to grow some? Difficult to say but possibly King Edward – a traditional variety, good for baking and later harvesting which usually means thicker skins.